The realities are it is pretty impossible to escape plastic in our everyday lives, but people are now increasingly questioning its widespread use and turning to many businesses to query why and what the alternatives are. This backlash is equally prevalent for the hospitality sector whether operating within hotels, leisure, foodservice or education and definitely an area that needs to be addressed. Simple steps can be made by using alternative materials or encouraging customers to re-use their plastic cups however surely this is just delaying the eventual impact. From a drinks perspective a far better direction is to remove the use of plastic cups entirely by using a free pour approach where customers can help themselves using glasses to a myriad of different flavours and types of drinks. This is where Oranka Juice Solutions’ diverse range of concepts lends themselves as people seek out concepts that are far more flexible, delivering much less formality while giving them more choice. Delicious juices, smoothies and hydration juices are readily available to self-pour into glasses. These feature any flavour and format of two or three juices where combinations can be altered to reflect seasonality and add variety. 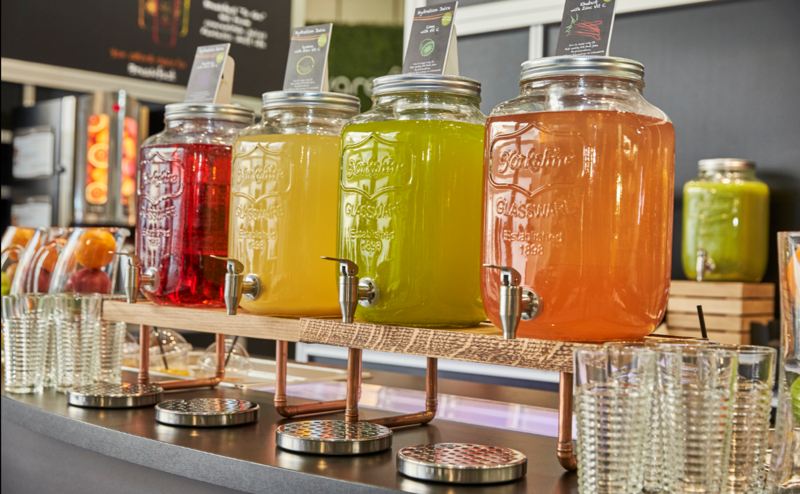 Served in stylish glass dispensers on wooden and copper risers this format works equally well in celebrated restaurants and hotels right the way through to independent schools.